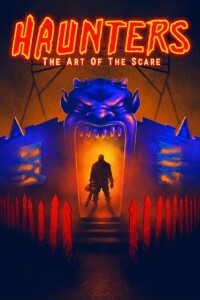 Haunters: The Art Of The Scare is a heart-warming and heart-stopping documentary about how family-friendly haunted houses for Halloween have spawned a growing subculture of extreme horror simulations. What kind of person dedicates their life to turning other people’s nightmares into reality, and how far is too far? Explore the rise of terror as entertainment, by going behind-the-screams and into the lives of Shar Mayer, legendary scare actor, Donald Julson, a traditional boo-scare maze designer, and the infamous Russ McKamey, as he creates the most controversial full-contact haunt of all time… in his own backyard. Also featuring John Murdy (Universal Hollywood Halloween Horror Nights), Jon Braver (Delusion), Josh Randall (Blackout), Eric Lowther (Haunted Overload), Bruce Stanton (Reign of Terror), Sylvia & Jen Soska (American Mary & GSN’s Hellevator), Jessica Cameron (Truth or Dare) and many more talented artists.